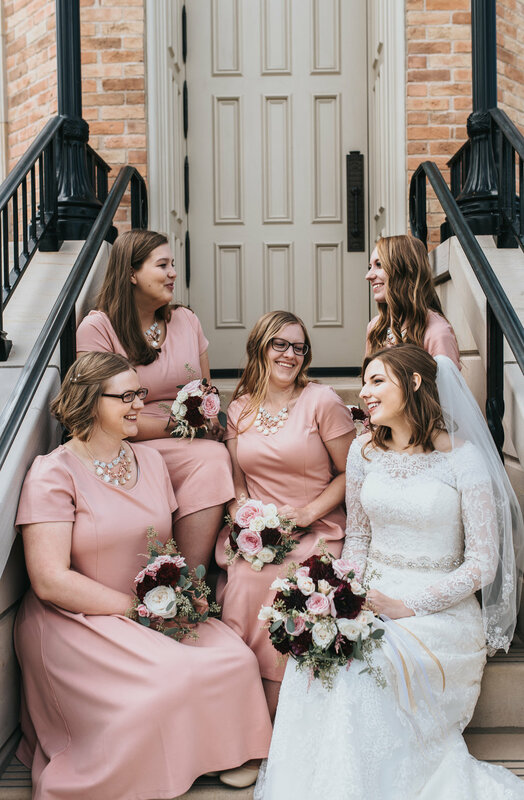 Jennifer & Alex's Big Day! Thursday, September 21st, was supposed to be a gloomy, rainy day. 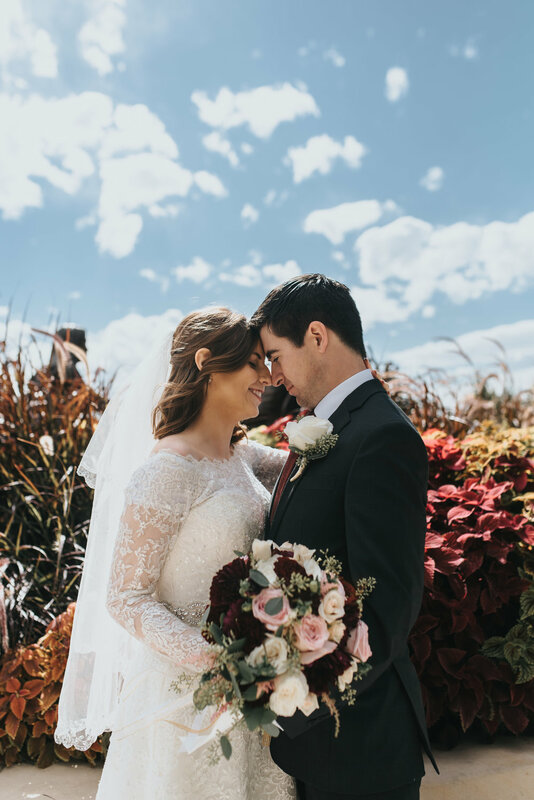 All weather outlets forecast it days ahead of time, but though that morning dawned cloudy and sad, soon the clouds gave way to beautiful sunshine down in Provo, Utah for Jennifer and Alex's big day! The Provo City Center Temple was just gorg! I waited patiently for the temple sealing ceremony to finish and it wasn't long before friends and family began to gather around the fountain with me. Soon, Mr. and Mrs. Alex Abeyta were about to debut as man and wife! We got faked out a few times as family members or other guests filed out of the temple doors ha! But eventually we got to see our beautiful bride and her new husband exit with smiling faces! Aren't the two lovebirds cute? I love seeing newlyweds and the sweet glow they have around them. It really translates into beautiful photos which makes my job so much easier! After the exit, I gathered all the family and friends to walk around to the opposite side of the temple which sat in glorious shade. It was a chilly September day, but that harsh Utah sun takes no prisoners and it wasn't long before I had my sweater tied around my waist for the afternoon. If you've never visited the Provo Temple, do yourself a favor. It's one of those buildings that doesn't look that impressive until you're right up on it and then its just amazing how big it looms over everything. It's also an incredible backdrop for beautiful family portraits! The entire family was friendly and welcoming to me, and we made record time with these portraits since everyone, including all the small children, were so well behaved and listened to my directions so well. We killed it! 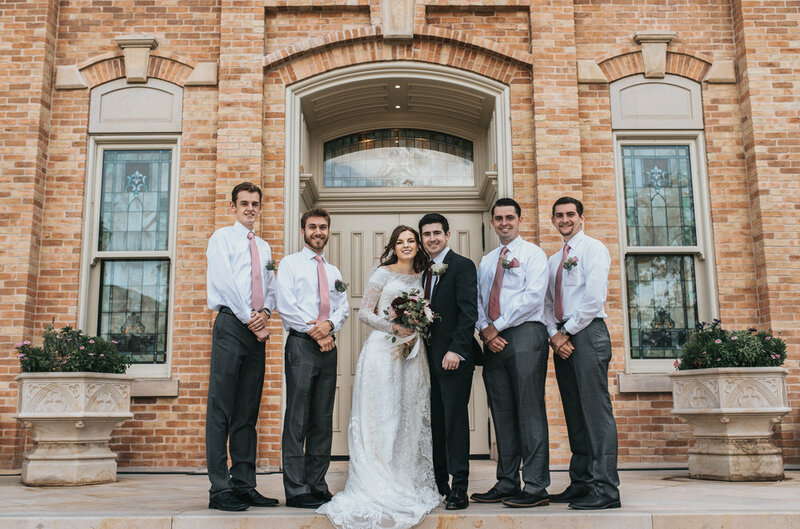 Even the wedding party was great to work with, both bridesmaids and groomsmen alike. They were all equally hilarious and we made the best of being hot, tired, and hangry when no one had eaten lunch and it was past 2 pm! Amazing right? They deserve high fives all around for being the perfect wedding party to work with. 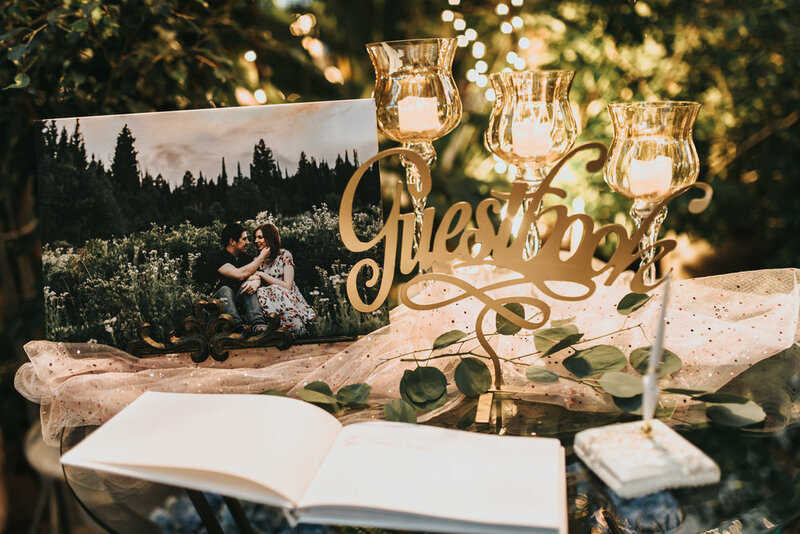 Jennifer and Alex were both starving, but they still managed to give me a few minutes for their bride and groom portraits and man, they didn't disappoint! That wrapped up our time that afternoon, so I sent them off to get some food in their bellies and I would meet up with the whole crew at their reception later on. The reception was being held at Le Jardin in Sandy, Utah and wow is all I can say. Talk about a perfect venue. 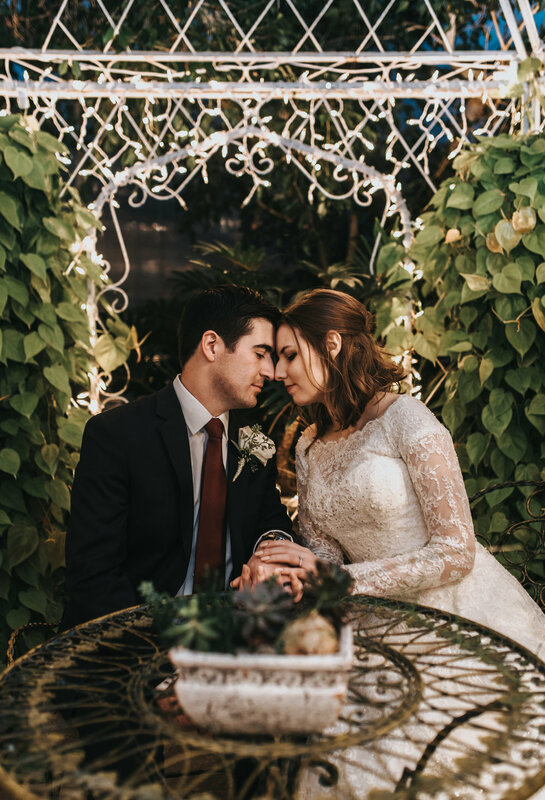 Vines and beautiful greenery cascaded from the ceiling and surrounded archways, twinkling Christmas lights lit up romantic alleyways and gazebos, and flowers and succulent plants popped up at every corner giving the entire venue a feeling of beauty, love, warmth, and romance. The entire space was just unbelievably gorgeous. Alex and Jennifer didn't look half bad under those twinkling lights either! See what I mean? Am I right or am I right? 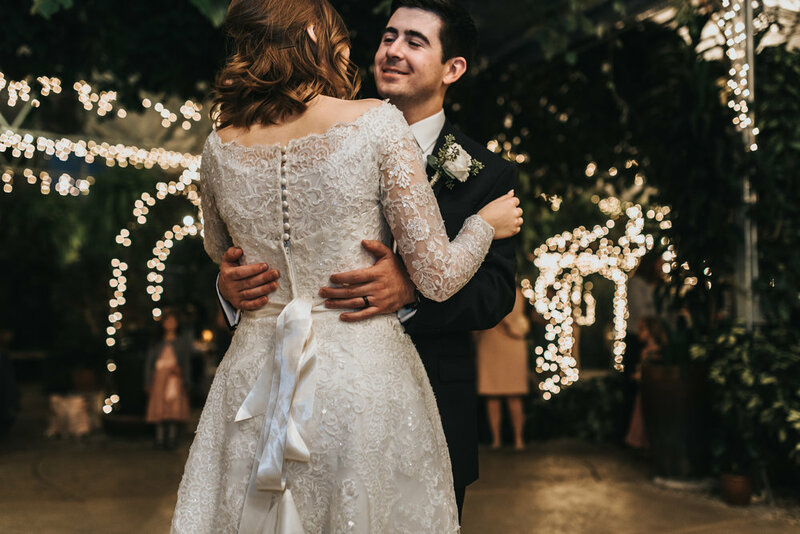 I am so glad I was able to capture the big day for these two, they were so sweet together and their families were so welcoming that I knew I had to make this special for them with amazing photographs so they could remember it for years to come. Congratulations you two! I wish you all the happiness in your many years together as husband and wife!